I’ve just had a lovely day at the RAF Museum at Cosford and got the chance to see a huge array of planes at close hand rather than as dots in the sky. I was particularly impressed by the Cold War exhibition – strnage to think that it was not that long ago. To be honest, I’d expected the museum to be a knitting-free zone but in the shop (who can visit a museum without venturing into the shop?) I came across the book “101 things to do in the War”, first published in 1940. Although it only devoted two pages to knitting, the book pointed out that the war had changed knitting from a leisure activity to “work of national importance”. 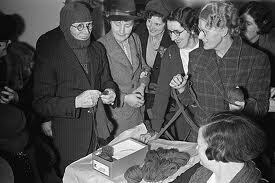 It explained that knitted garments were needed for evacuees (many of who came from poor homes and lacked sufficient clothing to cope with the cold weather) and for members of the fighting forces. Soldiers, sailors and airmen needed sweaters, gloves scarves and socks. It seems that you couldn’t just knit any old pattern – the book specified the measurements of gloves for sailors, including the length of ribbing at the cuff (three and a half inches in case you ever need to know). Requests for comforts for the troops may be long gone but those serving in the armed forces still need our support, especially those who get injured in the course of duty. We donate £1 to BLESMA (The British Limbless Ex-Servicemen’s Association) for every Ops-Sox kniting kit that we sell. BLESMA provides life-long support to service men and women who lose limbs, the use of limbs or eyes or the sight of an eye in the service of our country The youngest member is 19 and the oldest is 99 – truly support for life. Even if knitting is no longer classed as work of national importance it can still be a force for good and that justifies all the time I spend knitting when I should be doing other things! !